After a 1000 mile trip from Rapid City, SD, to Christmas, MI, I arrived where the WINs were parked at a National Forest Campground called, Bay Furnace. Although they had arrived several days before, there was still plenty for me to do over the next week. Monday we went kayaking on the AuTrain River. It was really a slow moving wide creek with lots of marsh and plants. Beautiful trip. Here we are getting ready to put in. Later that eveing we went on a cruise to Pictured Rocks National Seashore. The cruise lasted around 2 hours and we saw lots. But here is a picture of us on the top in the open air. But a few decided they would rather stay inside downstairs instead. This is Miners Rock, also called Castle Rock. And below is why they call it Picture Rocks. Lots of different colors on the rocks and many people say they see pictures. There were also caves and arches along the shoreline as well. This is Chapel Beach. Some people were even silly enough to get in the frigid water. We heard the water here on Lake Superior is only about 58 degrees. This is the largest of the many waterfalls we saw along the way. This one is Splash Falls. Actually this was the last day in the Black Hills with my grandson. Tomorrow we head to Steamboat Springs where we will meet his dad. So for our last trip we went to Wind Cave National Park. I can't imagine the 16 year old kid who explored and mapped this cave back in the late 1800s. We took the tour, 350 steps down and probably 1/4 mile hike through three large caverns, and it took us just over an hour. There were no stalatites or stalamites, but instead had what is called boxwork, popcorn and frostweb formations. This cave is the 4th longest cave in the world at over 128 mapped miles so far, all withing a 1 square mile area. There are even different levels. I didn't take the camera, but did take some pictures with the phone. I will post them later if they turn out to be any good. We stopped and hiked to a fire tower, but the tower itself was locked. Then on our way home we came across this bison who was giving his friends a ride. Do you see the birds on the bison's back? We actually saw two large herds of bison today, one in Custer State Park, just as we were leaving to enter Wind Cave National Park, and the other right outside the entrance to the visitor center at Wind Cave National Park. On the way back we passed through the herd in Custer State Park. And I do mean passed through. Cars were backed up both directions waiting for the bison to cross the road. We saw lots of animals at Bear Country, but this guy below, scratching his back, was just too cute. But by far, the best photo of the day was shot by my grandson. How many bears can you put in a tree?? Then on the way home we saw this little fawn run across the street in Custer. Her mama was nowhere to be found. I found her cowering, trying to hide in the bushes, but then she ran off again. I enjoyed my visit to Tatanka during the SOLOs rally, I knew I wanted to take my grandson there too. But we also had to visit Deadwood. We got to town just in time to see the first show of the day reenacting the killing of Wild Bill Hickock. After visiting Deadwood we went to Tatanka. In addition to the Interpretive program, we watched a video with Kevin Costner, explaining how Tatanka came to be. I guess I missed that the first time around. On our way home we ran into a hail storm just north of Custer. It hailed so hard I had to pull off for a short time since I couldn't see. When it slacked up I continued on, but the storm was moving south. 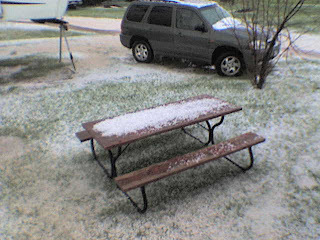 Shortly after we got to the RV park the hail hit again. Here is a picture of what it looked like outside. Saturday we started the day by hiking Grace Coolidge's Inland Fishing Trail. Named after his wife, this was a favorite place for President Coolidge to go fishing. Naturally it had a stream which we had to cross, 28 times over the 6 mile hike. Several had logs or rocks you could cross without getting wet, but with all the rain up here, the creek was quite high. It was above my knees on several crossings. But we had fun. Joshua waded upstream and caught up with me at the next stream crossing. Of course, he fell and had to get very wet. The black in the center is Joshua when he is wading upstream. Later in the evening we drove the Wildlife Loop in Custer State Park. We saw bison, wild turkeys, even a mother hen and her babies crossing the road, antelope and deer. But this fellow decided he wanted to see the inside of my car. One little baby bunny wouldn't even move from in front of the car so I had Joshua get out and help the baby along. We actually did more yesterday than just drive Iron Mountain Highway, but this drive is one of my favorite things to do here in the Black Hills. We saw the most beautiful rainbow I have ever seen on our way home and this is the first picture I am posting. Both Joshua and I feel that we have never seen a rainbow so bright and vivid. And it was a double rainbow and we could see the entire arc and both sides. Couldn't find the pot of gold, but it was a gold star rainbow for sure. The picture just doesn't do it justice. You can just barely make out the double rainbow here. We also visited Reptile Garden. Although I don't like to see snakes in the wild, I love visiting reptile zoos. And since I spent 4 months in the Everglades telling kids about alligators and such, I also enjoy these creatures too. But this kid above made me nervous. He did the snake show and the alligator show as well as the bird show and I guess he does them 4 times a day. We missed the bird show since it had started raining quite hard about that time. In the snake show he actually took out 3 poisonous snakes: a water moccasin (cottonmouth), a prairie rattlesnake which is common to SD, and some type of mamba I believe. Did I tell you he made me nervous? He did have on boots, but no gloves or even a long sleeve shirt. 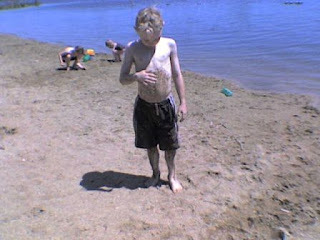 You probably can't tell, but he was a young kid too, I would say in his early 20s. But he was good. He told jokes and kidded around while giving the show. You could tell he really loved these creature. 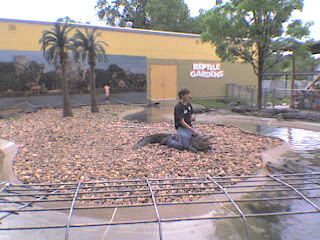 Now for the story above, here he was in a walled enclosure with 30+ crocodiles and alligators from all over the world. He explained why it is relatively easy to hold a croc or alligator's jaws closed with your bare hands and then proceeded to show us. He said they have to learn to do this, not for the purpose of alligator wrestling for shows, but in the proper care and handling of these things. Like when they have to move one or something. Did I mention this kid made me nervous? Here we are at the top of Iron Mountain Highway where we stopped at a lookout. Of course Joshua thinks it is necessary to show his strength by holding up this hole in the rock. Good job Joshua! This picture is here for the contrast. It isn't the best picture because it is dark and blurry, but Joshua was in the middle of the tunnel, I was sitting in the car right at the edge of the tunnel and right in front of us was Mt. Rushmore. I had Joshua snap this shot so you could see the outline of the tunnel and the car with Mt. Rushmore in the background. We also stopped at Custer State Park Visitor Center and got a state parks pass and picked up a map showing all the biking and hiking trails. Saturday we are going to do some hiking and biking. And on our way home we stopped in Hill City at the Alpine Inn for dinner. I had heard about this place when I was here several weeks ago, but never made it then. You see, they have no dinner menu. During the day at lunch they specialize in German food, which I did try and was very good. But at night you have 2 choices, 6oz or 9oz fillet Mignon, and how do you want it cooked. Every order is served with baked potato, butter and sour cream, a wedge of lettuce with house dressing (a great homemade ranch) and Texas toast. And don't try to ask for anything extra like cheese for the baked potato, because they don't have it. But the steak was good and it was fun way to close out the day. I picked up my grandson, Joshua, in Cheyenne, WY, for a week long road trip. Our first day was the trip back up to Rapid City. My plans were to stay in the Black Hills for the week, visiting the sites. But on the way there we found some places to stop too. We are standing in the wagon wheel ruts where hundreds, even thousands of wagons headed west. This path was known as 'The Oregon Trail, 'The Mormon Trail', and 'The Pony Express Trail'. The North Platte River is just north of us, but back in the 1800s it was much wilder than it is now since there were no dams along its paths. The settlers chose to take the high route over the rocks instead of the lower, river path. This was a blooming cactus along the path. Our next stop was Register Cliffs. These were just a few miles from the ruts. Nearby was one of the popular camping spots for the settlers and just like people today, they also liked to leave behind there notice to the world that 'they were here'. Along these sandy cliffs are many inscribed names dating back to the 1820s. We never found any that old, but did find many in the 1850s. And even some as recent at 2003. We then wound our way about 10 miles down the road to Ft. Larimie. Closed since the 1890s, this was an important fort for those travelers heading west. The soldiers here maintained peace with the Indians and Travelers and made for a stopping place along the way. Above is the Post Headquarters and Officers Quarters. They did have a picture of it before its restoration. It was about to fall down, but the park service has done a superb job of reconstruction. Inside it has been furnished as it would have been back in the 1800s. I believe this fort was built in 1849. These tents were on the outskirts of the post. Here the camp women and soldiers maintained their vigil. This was the temporary housing district. Many women were hired, most immigrants, to come out west and do laundry and cooking for the soldiers. Many were single when they signed on with the army, but many married the soldiers they cared for. Just a broader view of some other buildings. This was quite a large post compared to many I have visited in my travels. And this last photo is looking behind what I had just driven through. We hit a patch of rain and hail. Luckily the hail was small, but they were plentiful. The ground was absolutely covered with them. It was so dark I could hardly see at times. But we drove through it all in just a few miles. Looking back, this was the scene. This is just a glimpse of what the restaurant looks like. The walls are covered with pictures and memorabilia, while there are all sorts of interesting gadgets scattered around the rest of the place. Here you can see an old gasoline pump and the hubcaps. Here is my daughter-in-law, grandson and myself, standing underneath the sign for Sanford's. We stopped at a Starbucks and asked a local for a good place for dinner. Not a chain, but someplace with local flavor and Sanford's was her suggestion. We concur. It was great food and great atmosphere. By the time we left there was awaiting line to get in. Following the visit with my grandkids, I hurried over to the other side of SD, to the Black Hills for the SOLOs rally. We had 60+ single RVers who met at Hart Ranch. The first day the group took a chartered tour of the area, ending with a chuckwagon dinner. I had been to the Black Hills many times before, so I stayed behind to walk everyone's dogs. I was responsible for walking 13 dogs several times that day. It took me about an 1 1/2 hours to walk all the dogs at noon. Then it started to rain. By the evening it was still pouring, the wind was blowing and even the dogs didn't want to go out. I kept putting it off waiting for some slack. Each time the rain let up I would run over and walk another dog or two. Over a period of about 2 1/2 hours I finally got all the dogs walked again. 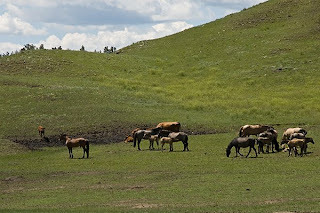 Day 2-I took a trip out to the Wild Horse Sanctuary. I forgot my camera, but I have a few photos that a friend took. This was by far my favorite trip. It was so much more than the wild horses. Such history about the ranch, the people and what has happened there. I highly recommend it be one of the places you visit in this area. Several movies were shot on the ranch, including some of Crazy Horse and Hidalgo. 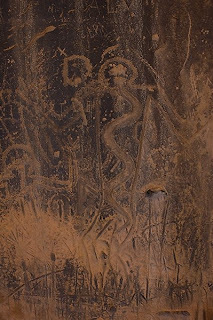 There were also petroglyphs found there, estimated to be thousands of years old. Day 3-Volksmarch. The only day of the year Crazy Horse Monument is open for people to actually climb. I was still battling the bronchitus, but I wasn't about to not make this walk. It was 6.2 miles and quite a climb to get to the lookout. It was worth it. We also saw some wild life. These mountain sheep (or goats) were not bothered at all by the thousands of people walking through their area. Later in the day we had an informal yard sale. One lady was selling some wigs, so of course all of us had to try them on. Here is my new look. Day 4-Sunday was an unplanned day, so I did some laundry and other routine things. Day 5-We visited Deadwood and took a tour. We also visited Tatanka, which is owned by Kevin Costner. It is a tribute to the Lakota Indians and the Buffalo. The Deadwood city tour took us to the gravesite of Wild Bill Hickok. Our tour guide was great, giving us all kinds of interesting information about the town, the people and the rich history of this area. Did you know the town of Deadwood was named because when the white man discovered it (looking for gold of course), the gulch was filled with dead wood? Following the tour some of us stayed and walked around town and visited some of the museums. We saw several shootouts and reenactments. Day 6-Everyone chose their own sightseeing today. Me and several friends went to visit the local winery. Yes, even SD has a winery. But all we got to do was taste their wines, no tours anymore for safety and sanitary reasons, at least that is what they said. Then we went out to lunch and a Walmart fix before heading back. Day 7-Goodbye day. It was time for all of us to say goodbye until the next time we meet. I got to spend a day with a 3 year old and 1 1/2 year old and boy did they keep me busy. But it's fun playing with the little ones. You get to do things you normally wouldn't do, like play at the play ground and act silly. So here are a few pictures of what the day was like. I limped into Mitchell with my alternator on the blitz. I had called my son and had him locate someplace for me to get this fixed. Of course, they didn't have the part in town and it had to be ordered special from Workhorse. This is one time I was glad I had an extended warranty. I was only out my deductible. But it did get fixed and it is one thing I don't have to worry about anymore. This past week has found me in Mitchell, SD, visiting some of my grandkids. What a joy. But especially because I took my 8 yr old grandson on his first road trip. Yes, it was short, only 2 days, but boy did we have a good time. Only about 120 miles away was Pipestone National Monument in Pipestone, MN. There was no campground there, so I stopped at Split Rock Creek State Park to camp. After parking the motorhome we hopped in the car and took off to see what Pipestone was all about. It was a quarry. The rock, called surprisingly, pipestone, was and still is used by the Indians to make ceremonial pipes. It is also now used to make trinkets which are sold in the gift shop. They have native sculptors demonstrating how to work the work also. The rock is made from compressed clay, which is sometimes as deep as 100 ft below the surface, compressed between layers of quartz. We walked around the small park, where Carter got to climb on rocks, and investigate the surroundings. One of the fascinating findings was the many bones laying in a rock den. But there was a beautiful waterfall as well. This was all within blocks of downtown Pipestone. Next stop was Blue Mounds State Park. Someone told us we should go there to see the bison. Well, the bison were so far out in the field we really couldn't see them. But it also said there was rock climbing. So back to the ranger office and we asked where was the rock climbing? They directed us to another entrance to the park. WOW! In Minnesota, who would have thought we would find this wall of rock. And again, within biking distance of the local town. We passed several rock climbers who had finished for the day, carrying all their gear. Carter got to do a little rock climbing of his own. Then it was back to Split Rock Creek. The next day we spent on the beach there, just enjoying the great sunshine and wonderful weather. I also had the opportunity to spend some time with my 2 younger grandsons. One day all three were having a great time wearing someone else's shoes. But then it was time to head to the SOLOs rally outside of Rapid City. I am the official dog walker today while most of the group took a motorized bus tour of the area. It took me over an hour to walk all the dogs at noon. It has been raining all afternoon and I have to walk them all again in about an hour. Hopefully it will quit raining. Someone even said they saw snow flurries earlier. What is going on? It's June!